As I watched the U21’s last week playing in shirts numbered 1 to 11, I became rather nostalgic for the old days before shirts displayed squad numbers and sponsors’ names. I must admit that I find squad numbers very helpful in identifying new players but I don’t like sponsors’ names on shirts. Anyone ignorant of the commercial aspect of the sport would look at my team’s shirts and assume I was supporting a team called Zapaygo. This entry was posted in Birmingham City FC, Football and tagged Birmingham City F.C., Football, Manchester United F C on October 6, 2014 by Puddleglum. Man U’s shirt deal is worth more than our club. That’s an interesting and true perspective, not only for us either. On shirts I was mystified why we need a third (Orange) kit that they played in for some odd reason against Millwall. We only really need it should Crystal Palace be away opponents in the cup. But it seems to be popular as a few were wearing them at the Valley. 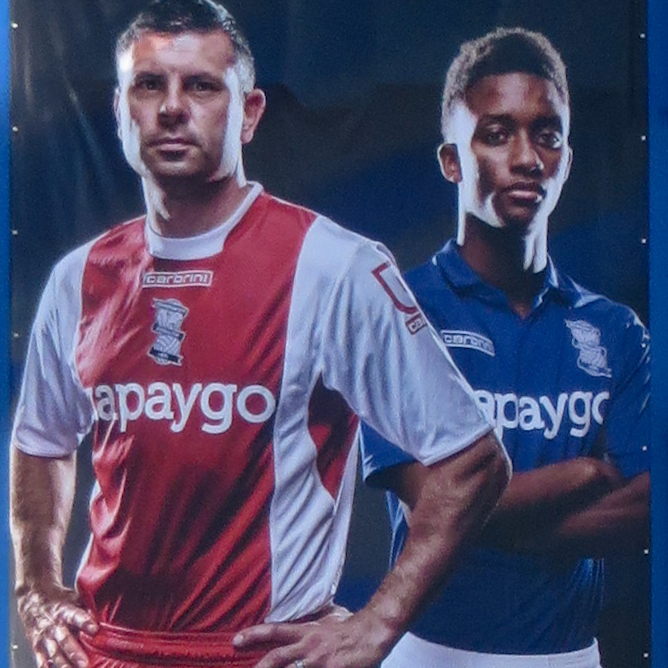 Blues wore blue shorts on Saturday, another kit mystery. The club were quick to sell branded’Peaky Blinders’ caps following the success of the BBC drama series but I wonder if associating ourselves with the City’s violent past is a good thing. Whatever,many fans do like the look and have become quite dandyish at away grounds adopting early 20th century apparel. That’s something sets us apart from Man U and the main stream. Boycotting the clubs sponsors? I have always boycotted football clubs sponsors but not ours. This means never eating Muller Rice, using Mita copiers and giving up gambling. I also sold my Rover car which was only a year old. They went out of business soon after!! I think the reason we played in all white at West Ham in the 70s was because our blue shirts were in the wash and our BELGIAN flag kit (fantastic) was outlawed as from side on with black shorts and shirts Trevor Francis and co might have been mistaken for the referee who at that time always wore black.